Many things make me smile in my dance career, enjoying a dance, watching a show, entertaining people, teaching, enjoying music and the list goes on. But what make me smile the most is current and past students! This weekend I was fortunate enough to be part of the 1st Annual Canberra Latin Festival, along with some amazing artists from Australia and abroad. It started at 5am in Tullamarine with a 7.5 hr drive with the team on board. A long drive made easier by our “sparkies” keeping the laughs flowing both their and on the way back! A huge congratulation to all involved with the event and a special mention to Raquel Paez for her invitation and hospitality. 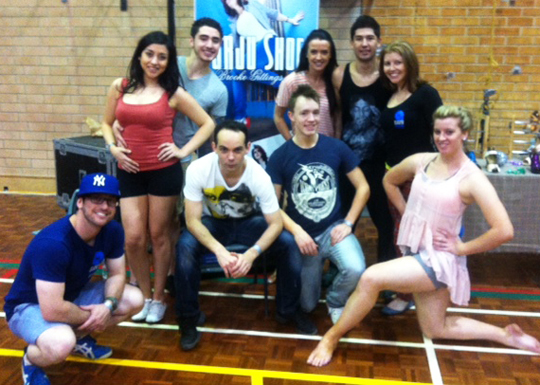 Melbourne Dance Hub, Team Spark, Brooke and I are all looking forward to the next one! This weekend I was able to watch my students perform, perform with them, watch them social dance, catch up with past students and friends and make some new ones. What a whirlwind weekend! I had a blast chatting and dancing with some old faces and was so happy to see the development of these people, not only as dancers but awesome people and friends. Nothing makes me happier than to know that in some small way, I have been able to pass on some happiness through my expression and passion for dance. On a side note some of the performances and performers this past weekend were super cool. My top ten would have to be – Mambo Elegante & Tanya Stocks amazing movement, musicality and creativity. Altitude Dance all three teams just wow!! Synchronicity and musicality was awesome. Juan & Josie I love watching these two dance together, Juan is always so happy and Josie is mesmerising to watch. Subsdance Samba – very cool transitions and energy. Flavoured Steps great combination of states and impressive as always. MVP Ladies Shines We have a soft spot for an ex Melbournian and IUAC star in the team but these ladies all smashed it. Jamie & Christina… Jamie as a leader in the Australian Latin Dance scene is inspiring as he danced with Christina, a student who has already shown growth since we saw them at the Australian Salsa Open 2012 and of course our very own Team Spark who represented us so well the entire weekend! Whilst I performed and watched our team tear it up, the smaller maybe more trivial moments are the ones that will stick with me. Watching our new generation and older generation dancing together. Sharing an embrace with an old friend. Congratulating someone on their achievements. Handing someone their first pair of dance shoes (thanks to Burju shoes by Brooke Gittings). A game of countries and movies on the ride up. Seeing old friends smile and laugh together. A common joke backstage. These are the things that make my job special. The reason why I continue and look forward to the next event/class/performance/dance. The reason I teach. The reason I dance. And thanks to dance, the reason I smile! My special thanks go to some of those who created these moments, Marco & Tiffany, Bec Vallejo, Crystal Jaffe, Team Spark, Becky Lee, Christina Chia, Raquel Paez, Christian Szilagyi, Olesya Sydorenko, Jamie Jesus, Carlos Galiano, Elli Torres, Jean-Luc and Brooke Gittings.